The Chief of Police (COP) is the highest-ranking officer in the Police Department. Tom Jarvie took over as interim Chief in November of 2017 and was appointed Chief on February 20, 2018. 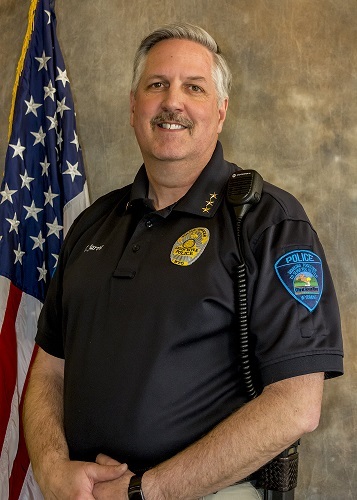 Chief Jarvie has been with the Green River Police Department since 1991. In addition to his 26 years with the Green River Police Department, Tom is also a graduate of the FBI National Academy and a veteran of the United States Army. “I am excited about the challenges ahead and I look forward to leading the department for the benefit of our residents, community, and our staff. There are trends that are impacting police forces across the country in all sizes of communities and we need to work on being more communicative and transparent in what we do”, “Green River is my home town. Patrol and Investigations are led by a joint Captain task force. Together they oversee the patrol operations, supervise over investigations, ensure compliance with the Department policies, procedures, regulations and standards; supervising the administrative and support functions of non-sworn personnel; interviewing and hiring sworn and civilian personnel. Cpt. 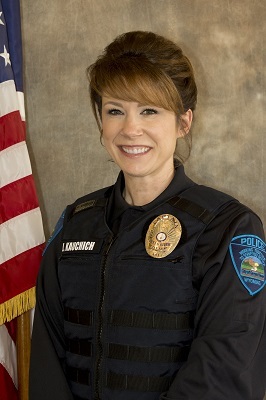 Janet Kauchich has been with the department for over 13 years. Cpt. Shaun Sturlaugson for over 15 years. Together they bring over 28 years of combined experience. Either Captain will serve as Acting Chief when Chief Jarvie is out of the office. Together they strive to provide exceptional leadership and commitment to the members of the GRPD as well as the community.